Place bacon in single layer on foil-covered rimmed baking sheet; sprinkle with sugar. Bake 20 to 22 min. or until bacon is crisp. Drain bacon on paper towels. Discard all but 1 Tbsp. drippings from baking sheet; reserve for later use. Bring cream to boil in medium saucepan on medium heat; remove from heat. Add next 3 ingredients; stir until chocolate is completely melted and mixture is well blended. Crumble bacon. Add 1/2 cup to chocolate mixture; mix well. Freeze 1 to 2 hours or until firm. Roll chocolate mixture into 24 balls; place on waxed paper-covered rimmed baking sheet. Freeze 20 min. Melt semi-sweet chocolate as directed on package. Stir in reserved bacon drippings. 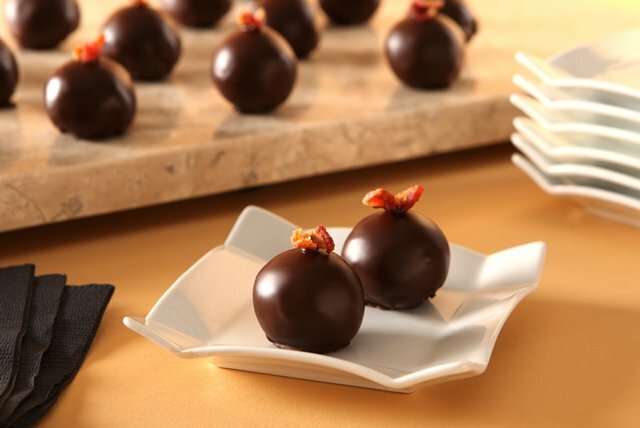 Dip chocolate balls, 1 at a time, in semi-sweet chocolate mixture, turning to evenly coat each ball. Return to prepared baking sheet. Drizzle with any remaining melted chocolate. Sprinkle with remaining bacon. Refrigerate 30 min. or until chocolate coating is firm.